DETROIT— As part of their new year resolve for 2016, the administrative staff of Lewis & Munday, P.C. launched Jean Day Fridays, an initiative in which staff and attorneys were permitted to wear jeans every first and third Friday of the month in return for a $5 donation to a fund that would be donated to a charitable organization at the end of the year. Over the course of the year, the staff collected $1,000.00 and voted to donate the funds to The Heat and Warmth Fund, THAW, a leading provider of utility assistance for Michigan residents in need. THAW is an independent 501(c)(3) non-profit organization that since its inception in 1985 has distributed over $172 million in utility assistance to more than 232,000 Michigan households. 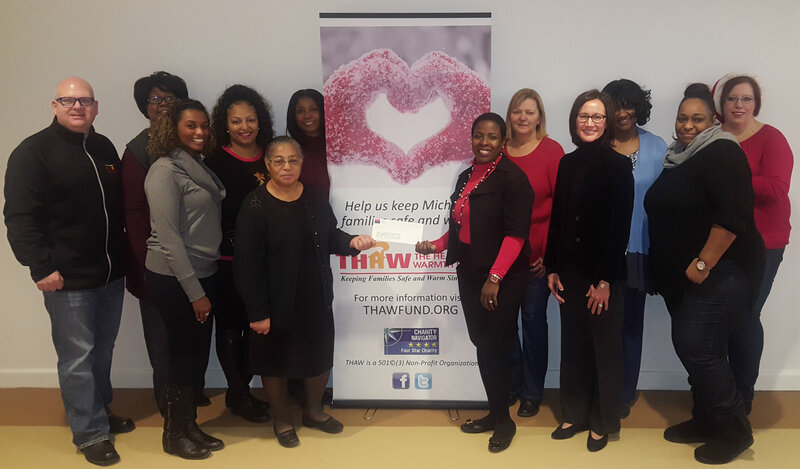 The staff of Lewis & Munday presented the check to Saunteel Jenkins, Chief Executive Officer of THAW, on December 16th, 2016.